However, the record has since been surpassed by many other Strads, which includes The Solomon Ex-Lambert (US$2.728 million), The Hammer (US$3.544 million), The Molitor (US$3.6 million), and The Lady Blunt (US$16 million). The Lady Tennant was originally owned by violinist Charles Philippe Lafont, a violin virtuoso of the 19th century. After his death in 1839, W.E. Hill and Sons, a London dealer purchased it. In 1900, Sir Charles Tennant, a Scottish businessman and Liberal politician, bought the Strad from Hill for his wife as a gift. It has since been called “The Lady Tennant”. 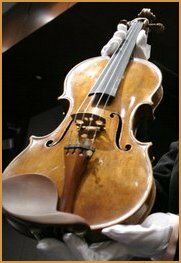 An anonymous buyer purchased the Lady Tennant Stradivarius in 2005, and presented it to the Stradivari Society for loaning out to promising violinists. The violin was on loan permanently to Chinese violinist and a Professor at Roosevelt University, Chicago, Yang Liu. He is also a Tchaikovsky Prize winner.